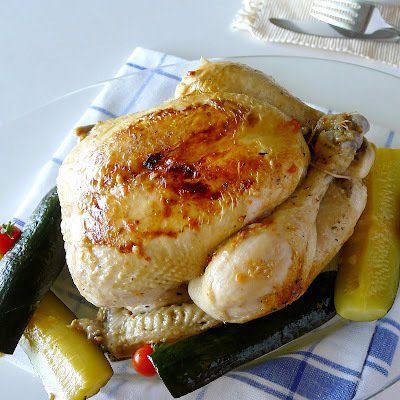 Pan-braised chicken is juicy and tender. What a racket! Banging pots and pans, hundreds of demonstrators gathered in Barcelona at the government delegation headquarters. They were protesting government corruption and calling for the resignation of Presidente Mariano Rajoy, who has been accused by the opposition of taking kickbacks from a secret slush fund, in the ‘caso Bárcenas’. This noisy protest is called a “cacerolada,” or, “pan banging.” A cacerola is a pan, usually metal, with a lid, for cooking foods on top of the stove. It can be a small saucepan, a two-handled pot in which you might boil up potatoes, or a deep sauté pan. In solidarity with the protestors, I banged some pans in my kitchen. Now, what to cook in this big cacerola? Chicken braised with wine seemed a natural. Small chicken just fits in a lidded sauté pan. I had a whole chicken that I intended to cut into serving pieces. But, then I realized that it would fit snugly under the lid of the wide pan. The Barcelona protestors, by the way, may have made a dent in their pans, but not in the ongoing political stew. Presidente Rajoy has yet to answer questions about who knew what when. Browned in olive oil, chicken is ready for pan braising. 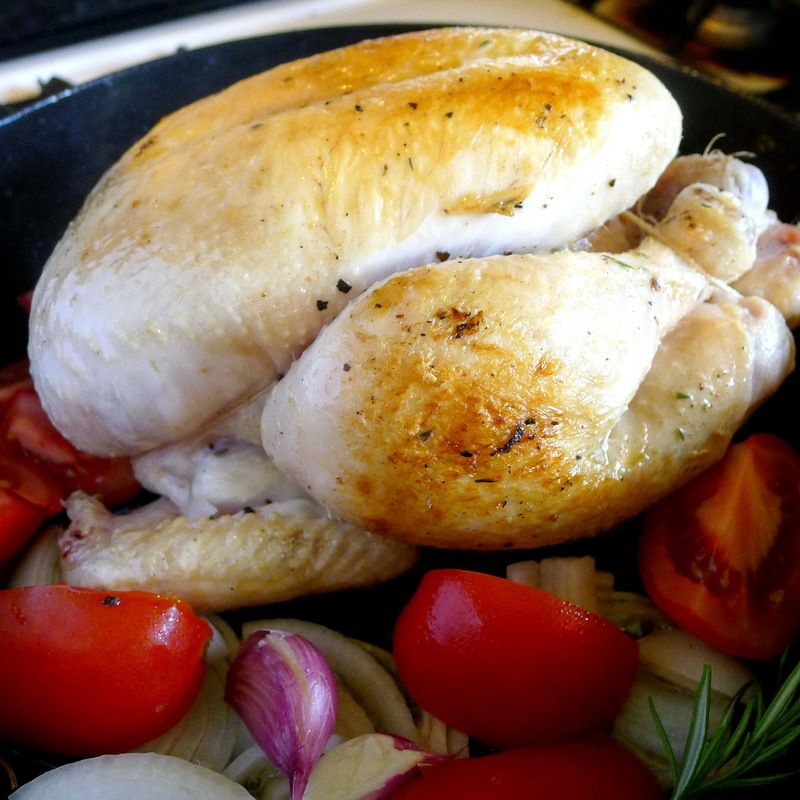 Use the tag end of any bottle of wine to cook the chicken--white, rosado (rosé), red, cava (sparkling) or Sherry. If you like, add vegetables--carrots, potatoes, zucchini-- to the pan with the chicken. Chopped parsley or chopped olives can be added at the end as a garnish. Tie the chicken legs and wings together so the chicken stays compact. Sprinkle with salt and pepper inside and out. Allow to set at room temperature for 30 minutes. Heat the oil in a deep sauté pan. Brown the chicken on all sides. Turn it breast side up. Add the sliced onion. Lightly crush the unpeeled garlic cloves and add them to the pan with the tomatoes, rosemary, bay leaf and wine. Cover and simmer the chicken for 40 minutes. Turn the chicken, breast side down and continue cooking until chicken is tender, about 20 minutes longer. 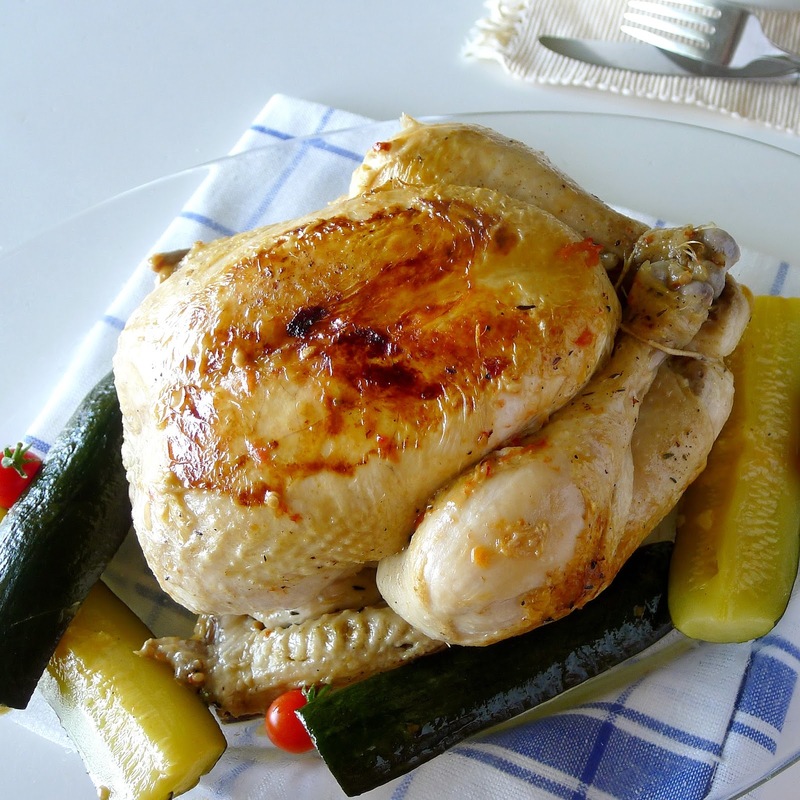 If chicken is to be served hot, remove it to a cutting board and allow to set for 10 minutes before carving. Pour the pan juices through a strainer, discarding the solids. 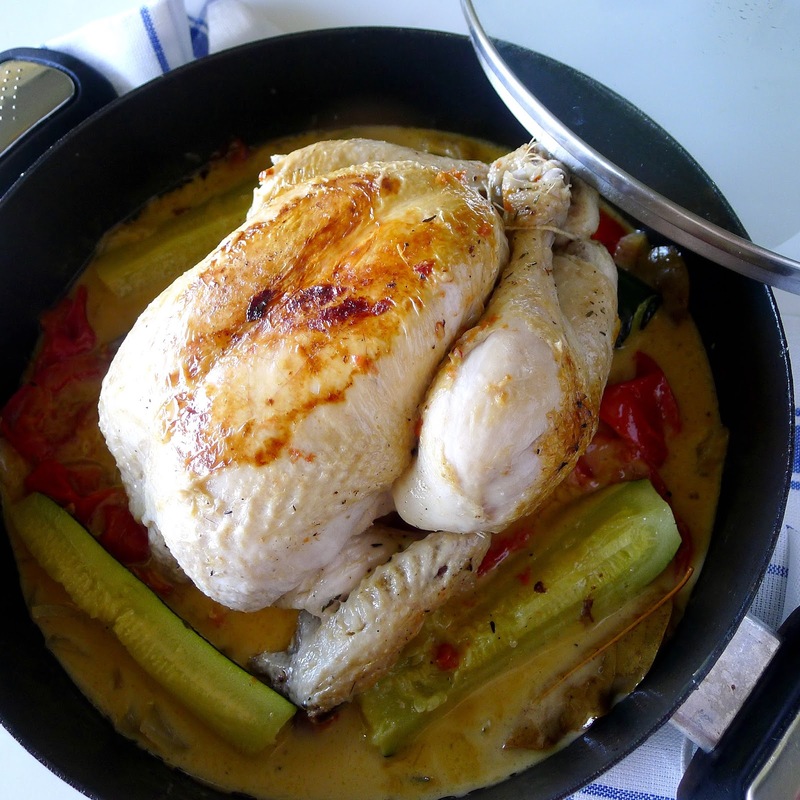 Skim excess fat off the top of the sauce and serve with the chicken. 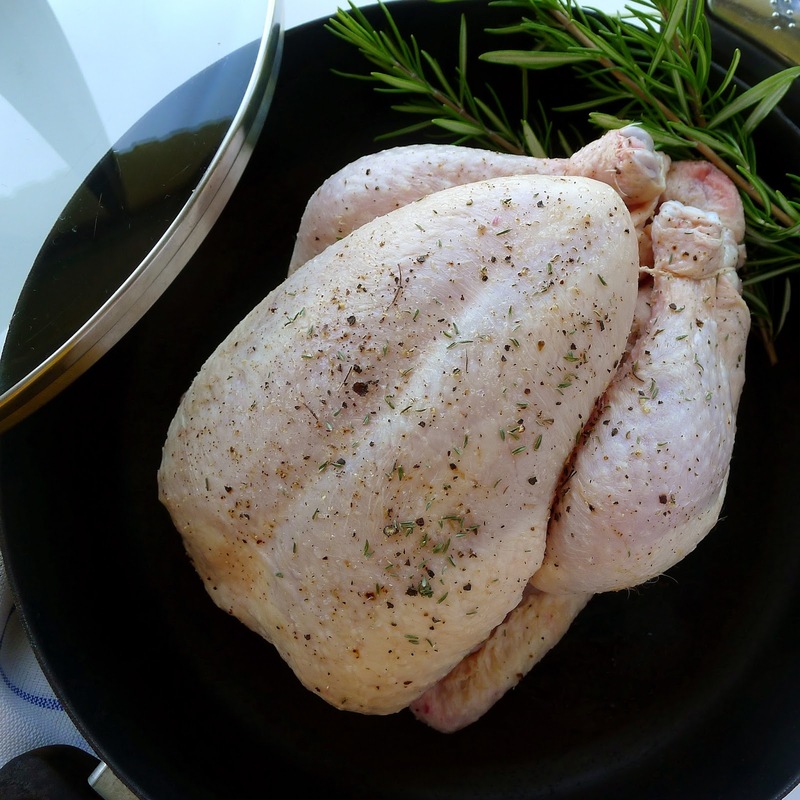 If the chicken is to be served cold, allow it to cool completely in the pan. Then remove the chicken to a covered container and refrigerate. Strain the sauce and refrigerate separately. 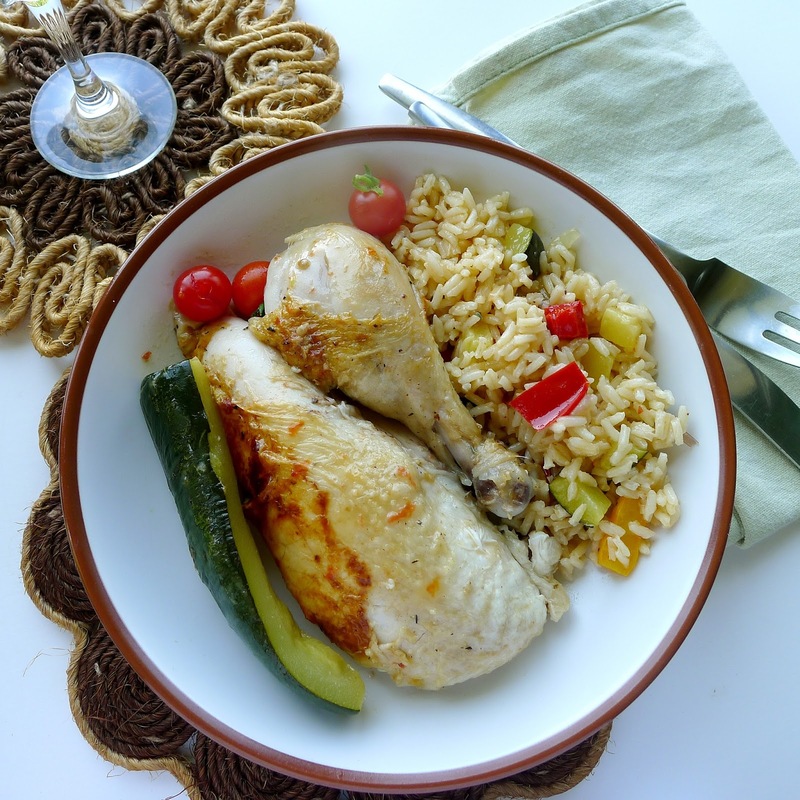 Wine-braised chicken with zucchini, ready to serve. Carved and plated, braised chicken is good hot or cold. Ice cream with fresh plums. No cream, no sugar. No ice cream maker either. Is it ice cream? 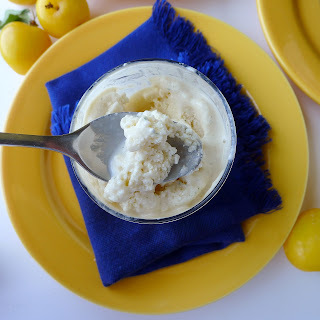 Maybe not, but my house helado (the Spanish word for ice cream just means “frozen”) fills all the summer requisites—it’s icy-cold, refreshingly flavored and sweet to the taste. My basic mix is pureed fresh fruit, a squeeze of fresh lemon juice, non-fat plain yogurt and enough artificial sweetener to sweeten the mixture to taste, which for me, is not too sweet. Blend to break up icy chunks. I use a hand-held blender to puree all the ingredients in a bowl. The bowl goes into the freezer until the mixture is partially frozen (about 2 hours). 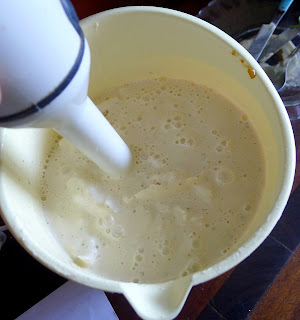 Then I use the blender again to beat it smooth and incorporate some air in the mix. I pour the ice cream mixture into individual cups (juice glasses, about 2/3-cup capacity), place them all on a tray and return them to the freezer. That way, I can remove one or two cups at a time, rather than softening the whole batch to dipping consistency. Individual cups are also an easy way to serve a crowd. 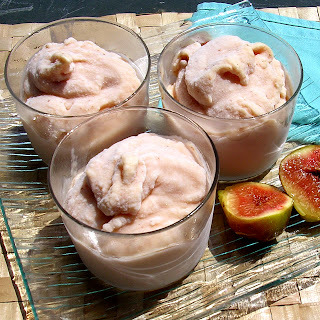 My original helado recipe was with nectarines (unpeeled—the flecks of skin don’t bother me), yogurt and liquid sweetener (cyclamate/saccharin). Since then I’ve been spinning off variations. I use whatever fruit is in season—strawberries, apricots, loquats, peaches, raspberries, figs, prickly pears (that recipe is here), mangos. This week I’m using up a basket of fresh plums (see another plum recipe here). I pureed the plums, then sieved the pulp to get rid of the skins. Instead of liquid sweetener, this time I used stevia leaves picked from plants that I have growing in pots (thanks, Charlotte!). 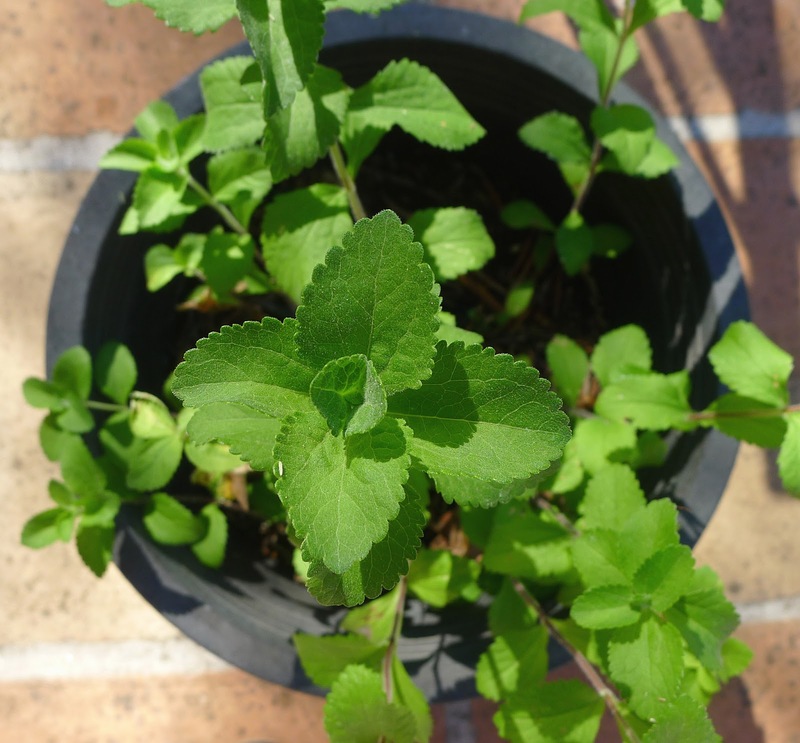 Stevia, also called “sweet leaf,” is intensely sweet with a slight bitter-herb flavor. 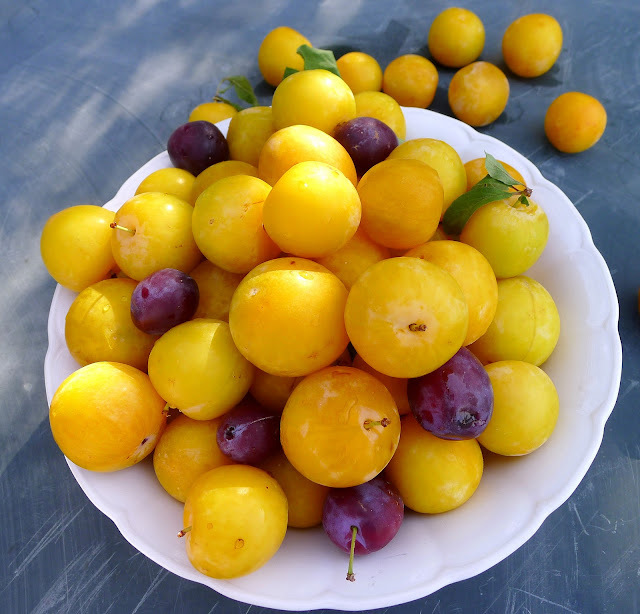 The plums were so tart that a small handful of leaves, pureed with the fruit, did not provide sufficient sweetness. So I added stevia extract, a white, no-calorie powder commercialized under various brand names, until it was sweetened to my taste. In my next batch of ice cream (peaches coming up), I will try steeping stevia leaves in hot milk, to see if the sweetness intensifies. Whether you use an artificial or natural sweetener, including sugar or honey, I suggest adding it to the mixture little by little, to taste. For the dairy component, I use part no-fat yogurt, part full-fat Greek yogurt and part non-fat queso batido, a thick, creamy quark cheese somewhat like no-fat sour cream. For an especially rich and creamy ice cream, I use a small carton (about 1 cup) of mascaparone in place of the Greek yogurt. The mixture of fruit, yogurt and quark adds up to about 6 cups, with the fruit puree making up between 1 and 2 cups of the total. Fresh mint complements plum ice cream. I also experiment with added flavorings. 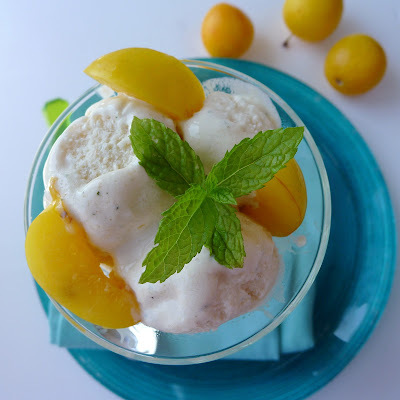 Mint goes well with plums and with prickly pears. Basil, rosemary or thyme pairs with nectarines and peaches. Ginger is a natural with mango. 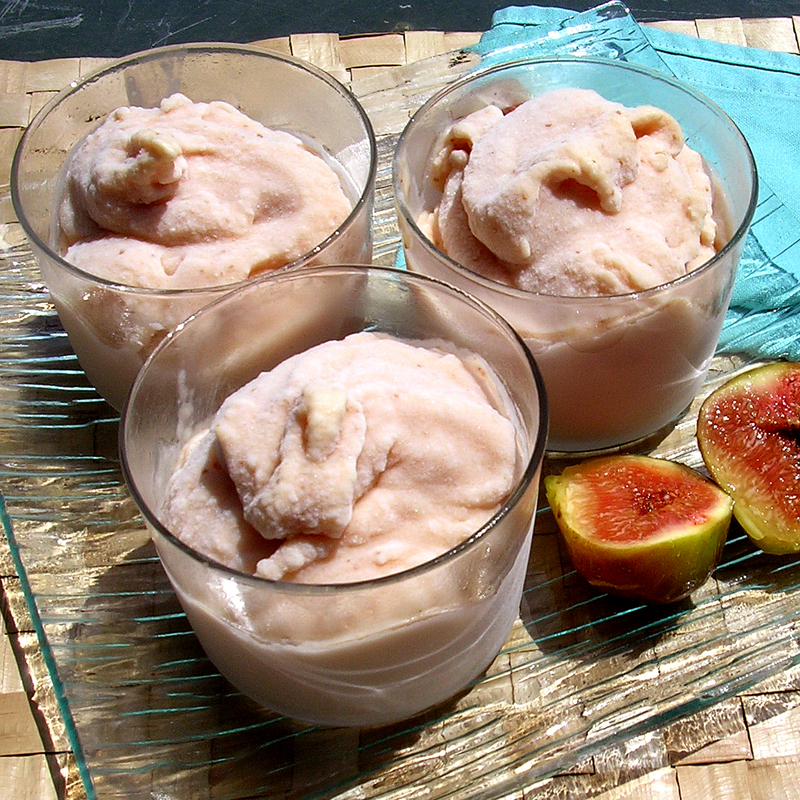 Figs want vanilla. Cardamom spices up apricots. Creamy and icy at the same time. This home-made ice cream needs to soften 15 to 20 minutes before serving. Then it’s creamy, but with a slight icy texture. Personally, I love it that way. 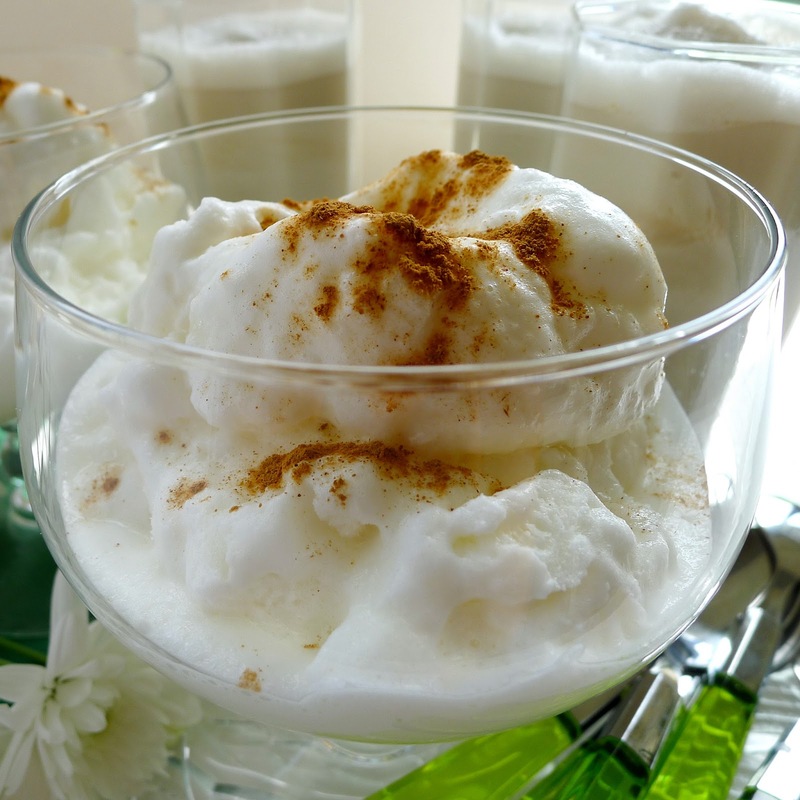 Some more ideas for home-made ice creams appear here. Leche merengada, ice milk with egg whites and cinnamon. When my grandson Leo arrived to stay with us, he was toting a bag of toys and a bag of golden yellow plums (ciruelas; ciruelas-pasas are prunes), picked on his Nana’s finca (farm). I’ve been enjoying them for breakfast every day. Now I’m branching out—looking for other ways to use them up. 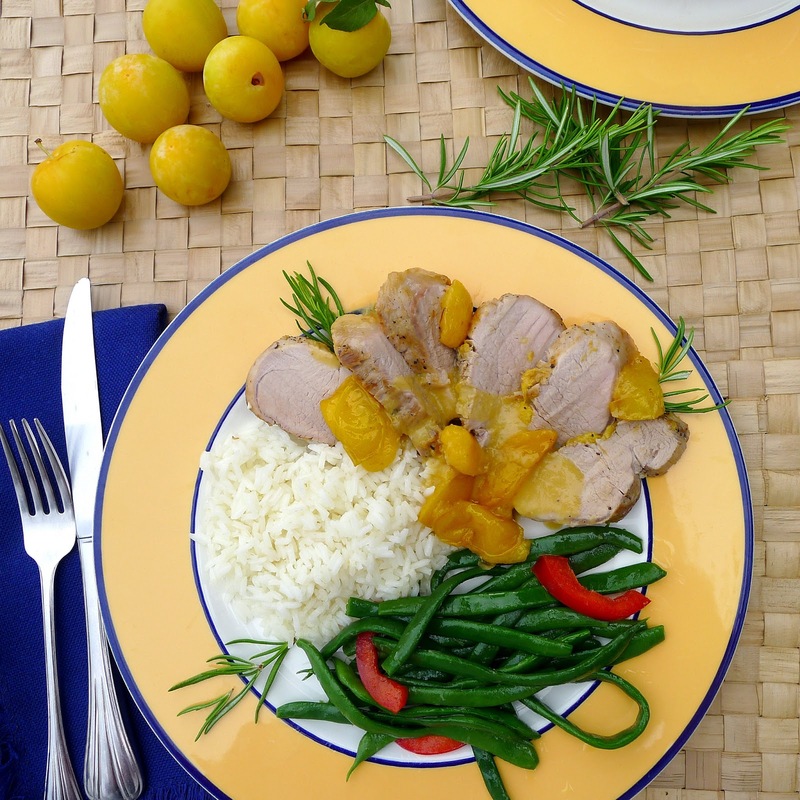 Plums, which are naturally sweet and sour, go especially well with pork. This sauce could also be cooked with small game hens, with lamb chops or with salmon. 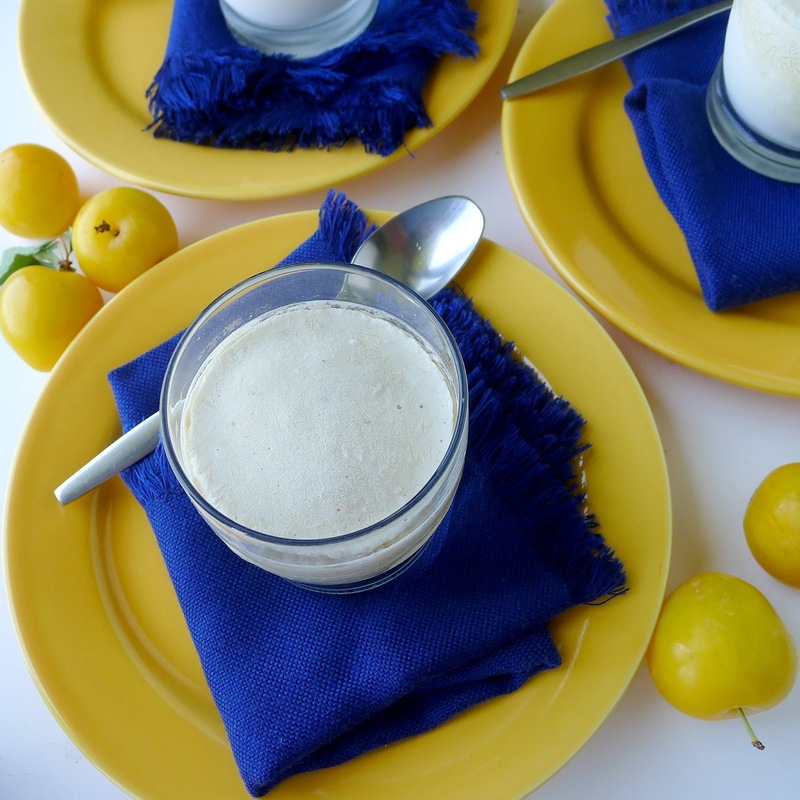 This recipe can be freely varied, using whichever variety of plums is available. I pitted but didn’t peel the plums, as the skins contribute tart flavor. I removed some of the partially-cooked plums to use as garnish with the meat. Then I pureed the rest with the sauce and put the sauce through a sieve to remove the bits of peel. You can use any slightly sweet wine for the sauce. I have tried martini rosso and white vermouth. This time I used Pale Cream, from Montilla-Moriles, because that’s what I had available. Pale cream Sherry from Jerez is the equivalent wine. Taste the sauce; if too tart, add just a little honey. 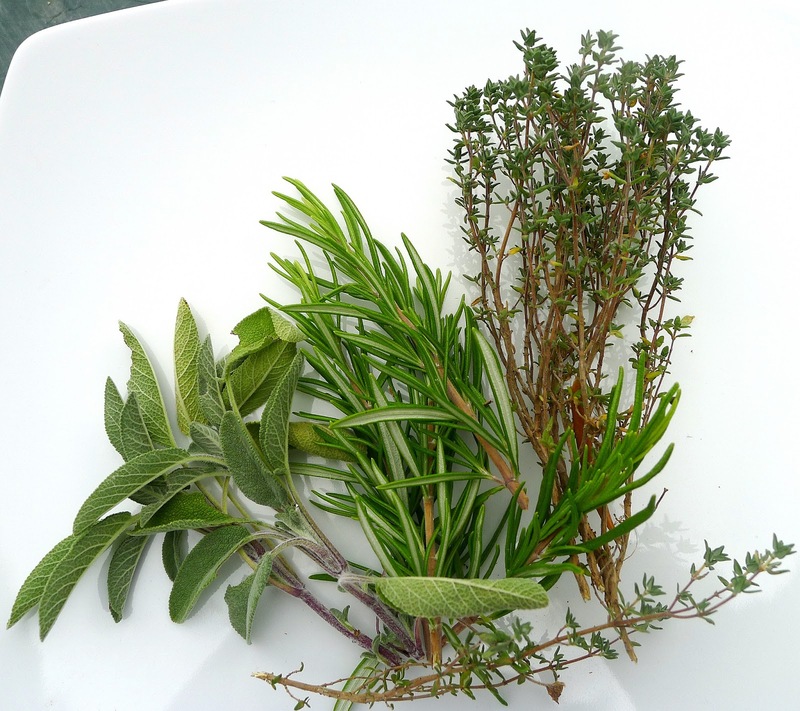 Mediterranean herbs—thyme, rosemary, sage—complement the plums. 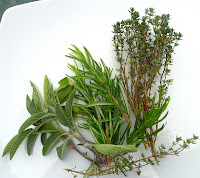 My favorite is thyme, but I decided rosemary was the best pairing. 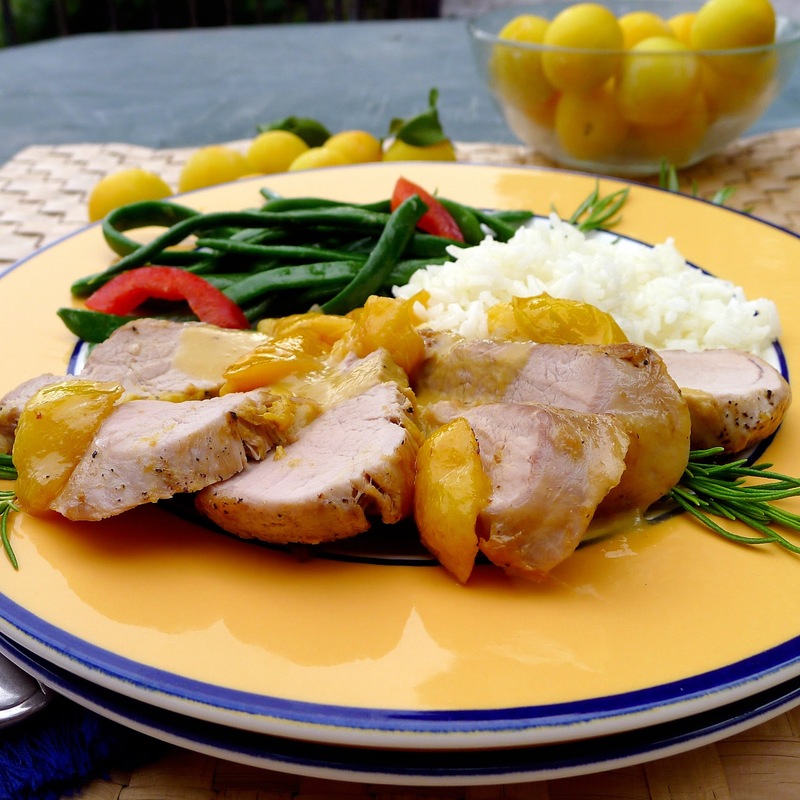 Pork tenderloin is the most tender cut of all. But, because it has little fat, it can be dry if overcooked. If possible remove the pork when it is still a little pink in the center. About 145ºF if you have an instant-read meat thermometer. Plum sauce with rosemary complements pork tenderloin. Sprinkle the tenderloins with salt and pepper and allow to stand for 30 minutes. Heat the oil in a pan and brown the pork on all sides. Remove them. Add the shallots and chile, if using, and sauté 3 minutes. Add the plums and sauté another 2 minutes. Add the wine, water and rosemary. Return the tenderloins to the pan. Cover and simmer 8 minutes. Remove pieces of plums to use as garnish for the meat. Turn the tenderloins. Cover and cook another 8 minutes (to an internal temperature of 145ºF). Remove the meat to a cutting board and allow to set 5 minutes. Remove the sprig of rosemary.Transfer the sauce in the pan to a blender and puree it. Pass it through a sieve. Slice the tenderloins. Serve the meat with the reserved plums and the sauce. Tender pork and tart-sweet plum sauce, a perfect combo. Watermelon ! My kids, Daniel and Ben. Grandkids, from left, Lucas, Nico and Leo. A cheer went up at the table. “Yay, GranJan got it right!” Three kids, three different sandwich preferences. It took me several attempts to tailor-make each sandwich. The fresh-baked buns (not too crusty) from a local panadería were fine with all. Leo, 9, likes mayonnaise on his ham sandwich, hold the cheese, with sliced tomato and lettuce too. 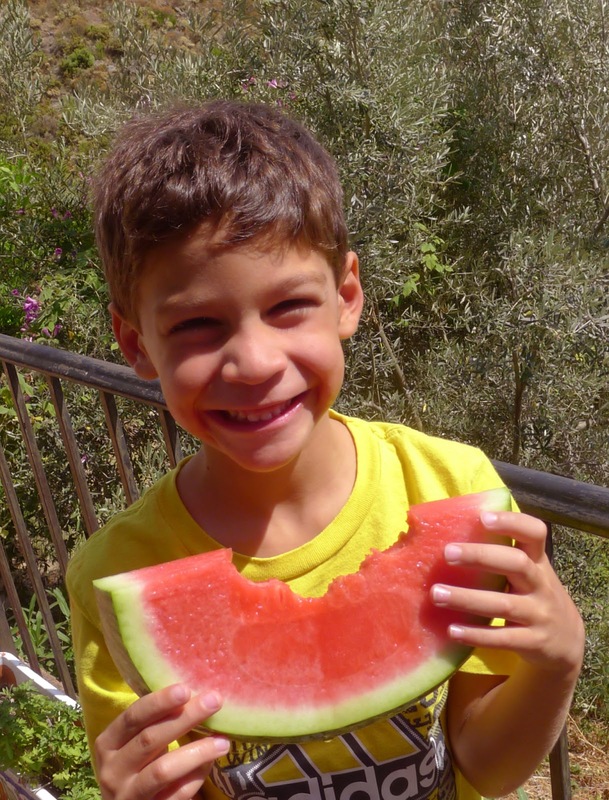 Lucas, 8, won’t eat tomato, but loves cheese on his sandwich. He’s OK with lettuce. Nico, 5, prefers tomato on the side and might eat the bun with mayo and leave the ham. Or, surprise, the next time he wants everything and gobbles it up. By now, I think they’re playing me for a patsy. But, with grandkids, that’s ok too. A little play is fun. Trying to give them what they want makes me happy. Succeeding at pleasing them is a joy! All meals are kid-friendly. Even though there are four of us adults and only three of them, food is not spiced. Weaned on pizza, it seems everything except oregano is “spicy” in the kid lexicon. Mozarella and oregano are as comforting as mother’s milk. That’s not completely true. Lucas and Nico have a Venezuelan abuela who makes them calamares en salsa (squid in sauce), with adobo spices including garlic, cumin and oregano—but, no chile. From her I learned that kids like their sauces smooth, with no identifiable pieces. So I put the onions and green peppers through the food processor; puree the tomatoes in the blender. 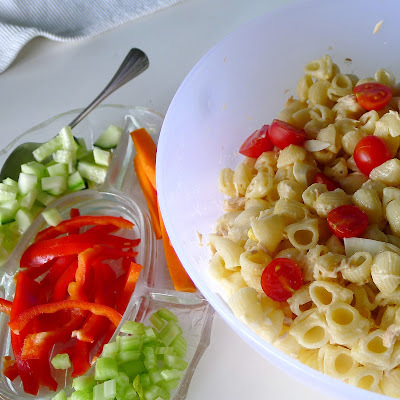 I make tuna-mac, a lunch dish my sons (now dads) loved when they were little. Shell macaroni, canned tuna, mayonnaise from a jar (I blend it with some yogurt and no one is the wiser). However, I know not to add any chopped onion or celery or sweet red pepper. All that I serve on the side for each to add according to his tastes. But there’s room for experimentation. Leo shows his primos how to eat artichokes, pulling the leaves off one by one and dipping them in mayonnaise. Artichoke eating has high entertainment value. Nico, who’s never heard of an artichoke before, calls them “party-chokes”. Nice. In the garden, I show the kids how the uncut artichokes have opened into spectacular flowers. Gazpacho does not score. All three kids grudgingly taste it. They make various sour faces. Try again next visit. Lucas loves green beans. He eats a huge serving of them, par-boiled and sauteed in olive oil. 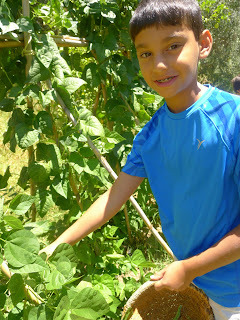 (I showed him where olive oil comes from--little olives on the trees.) He helps me pick beans from the garden for another meal. He also loves gambas a la plancha (jumbo shrimp grilled in their shells), but that’s a special treat. 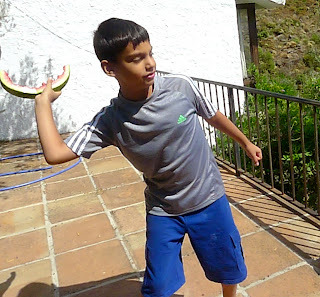 Leo’s special treat is jamón con melón, slices of sweet melon with Spanish ham—serrano or, his favorite, “pata negra” ibérico. 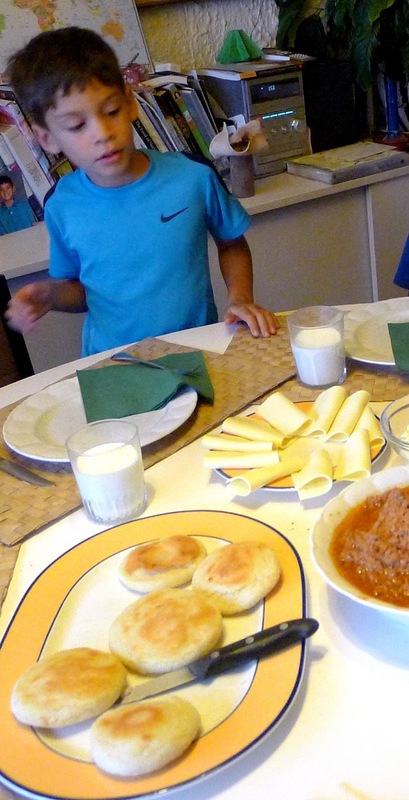 My son Daniel, who is Lucas and Nico’s papá, makes breakfast omelettes for the crew. With grated mozzarella and chunks of hot dogs (not approved by management), they are a hit with the kids. Everybody loves watermelon! They eat it out on the terrace where the drips don’t matter. 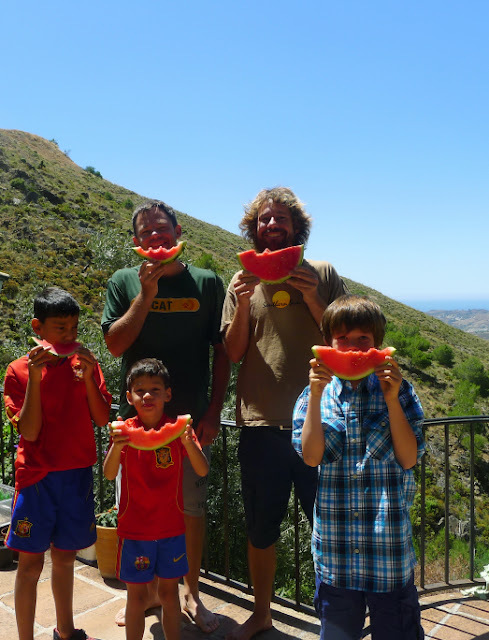 Then Ben, Leo’s dad, shows the kids how to make a “melon-copter,” launching the melon rinds out over the olive trees into the arroyo. 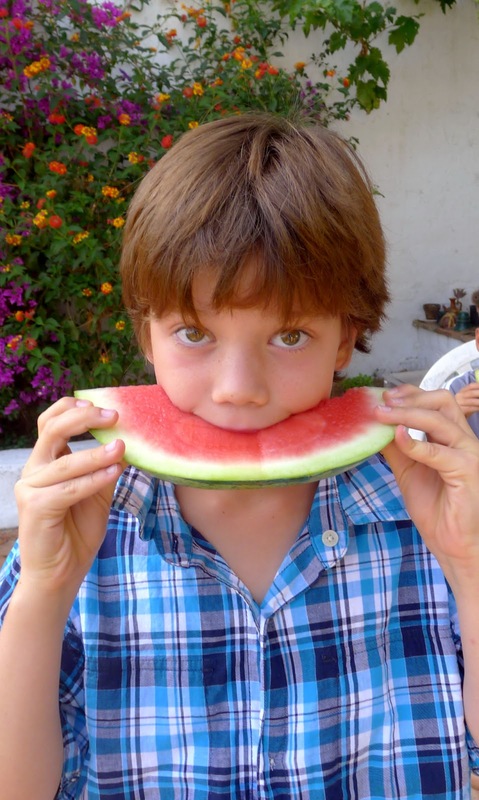 Lucas launches a melon-copter into the arroyo. Tonight we’re having hamburgers. I made a pinto bean salad, Spanish potato salad with lemon dressing, and classic cole slaw. As all three kids declared they don’t like beans (except green beans), I put grown-up seasoning in the bean salad, but keep the potatoes and slaw on the bland side. Vamos a ver. Next week, grandchildren will have departed. Think I’ll have some spicy Asian noodles. All by myself.